Collect data on your PC using your sound card or a simple analog to digital converter. Store, retrieve, and edit strip chart files with header information secured within the file itself. Share your real-time data with others over the internet even if you use a dial up connection. Send live data to multiple recipients. Send and receive data simultaneously from multiple sources. Use in Stand Alone mode for local use only. A built in chat window allows you to communicate with others during observations. Can be used for radio astronomy, seismology, weather, any scientific or industrial monitoring task. Automate real world tasks using LabJack ADCs, control industrial processes, home heating, solar power. New (2013). Connect directly to your Arduino projects and graph your data!. Version 2.3 packed with new features. Read about them here. Educational Institution (Pro) $49.95 + 24.95 for additional workstations. Commercial - Industrial (Pro) $149.95 +99.95 for additional workstations. Order the Appropriate License for You! Read the help file for more information. 512 MB of RAM recommended. Microsoft Internet Explorer 4.0 or better. Internet connection if want to share data on line. ** Note: Pro Version User Data Source model allows potential connection to almost any data source. Read about this feature here. Infrared and visible light fluctuations. Various other analog and digital sources for more experiments and tests than I can possibly count. Thanks for this wonderful program, and please keep up the good work! Firstly, your software is so fantastic that I am totally Flabbergasted especially with Radio-SkyPipe! Here you have achieved a wonderful level of excellence. As President of the European Radio Astronomy club I wish to congratulate you for making this wonderful tool for radio astronomers world-wide available. You have done a real wonder for the radio astronomical community . I can't thank you enough for Radio-SkyPipe. I have my radiotelescope working very well and have been able to see the galactic plane as well as Cyg A, Sag A and Taurus. 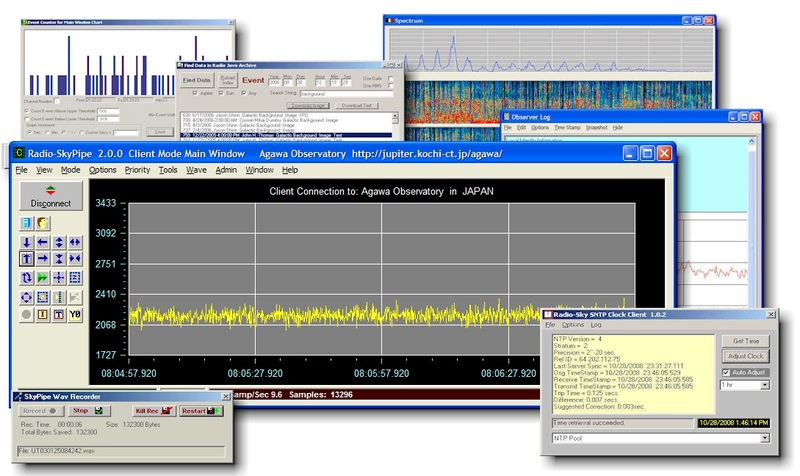 Radio-SkyPipe has made radio astronomy fun. ...BTW, your documentation on Radio-SkyPipe is very good. Looking forward to the new version. Thanks again for your efforts. It has been my salvation. * Not to be confused with SkyPipe® of AOS, Inc. If you are looking for them please visit www.aosusa.com .